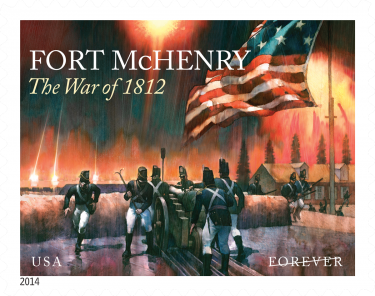 The USPS created a commemorative stamp for the bombardment of Fort McHenry during the War of 1812. This is a great collectors item, especially for all of you history buffs out there! A portrait by Rembrandt Peale of the fort’s commander, George Armistead, appears on the reverse of the stamp sheet (courtesy of the Maryland Historical Society). The selvage engraving on the front of the sheet is a black and white version of a painting by Percy Moran depicting Key aboard the ship from which he witnessed the battle. The stamp sheet includes verso text and selvage text. For some 25 hours beginning on the morning of September 13, a squadron of the Royal Navy fired more than 1,500 rounds of shells and rockets at Fort McHenry, which was designed to protect Baltimore from attacks by sea. Key witnessed this massive display of firepower from the deck of an American flag-of-truce vessel, where he had just completed negotiations with the British for the release of an American prisoner.